Alison Shaw and her mother, Amy Cierzan-Shaw, held hands and locked eyes as they walked toward Alison's fiancé and her future. It was a day they had dreamed of and planned for. They'd imagined the white dress and the flowers, the music and the vows. 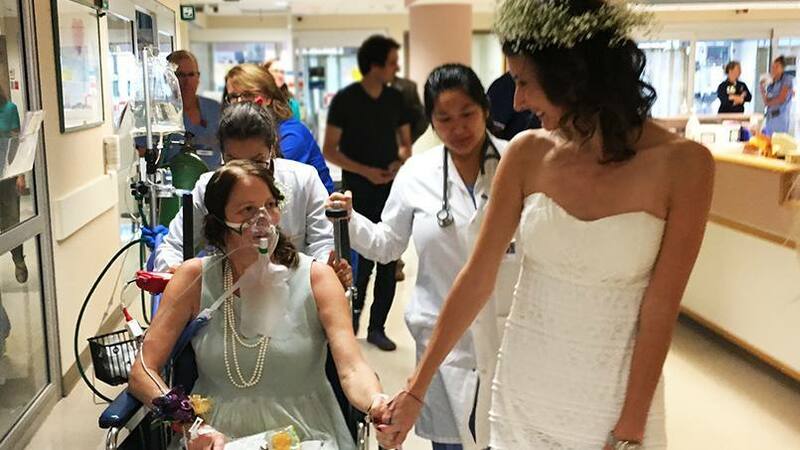 What Alison and Amy hadn't imagined were the oxygen tanks and wheelchair, or the doctors, nurses and respiratory therapists that accompanied them on that walk. They hadn't imagined Amy being diagnosed with stage 4 lung cancer 11 months before Alison was scheduled to be married. After that diagnosis, Amy made it clear that she intended to watch Alison walk down the aisle. When her care team asked Amy about her goals, "my first response was that I be there to see my daughter get married," she recently told us. And one Sunday afternoon, in a sunny atrium close to her hospital room, staff at Mayo Clinic made sure that she did. Read the rest of Alison and Amy's story.